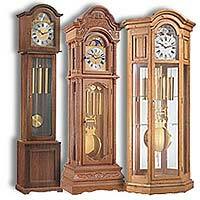 Repair floor clocks - it is a necessity that arises from time to time any holder of a floor clock. As a rule, the owner decides to repair floor clocks when the clock stops, or start to lag significantly. The main enemy of hours not strange - time. Ideally, to ensure normal operation of the mechanism should be to clean every 6 - 8 years regardless of whether the clock run normally or not. Oil life usually does not exceed 6 years, then it loses its physical properties and moving parts are at increased friction, which causes production - the most common cause of failure mechanism. Our master always performs general repairs (major, full), floor clocks. Repair floor clocks necessarily involves cleansing mechanism, which aims primarily to remove the old grease. New grease on old cast is impossible. In addition, for different nodes using different lubrication mechanism. Master of generating repair floor clocks must have sufficient experience to diagnose. Before the problem persists, it must be found. Our studio produces high-quality repairs with a guarantee of hours of floor. Where appropriate mi restoring damaged or worn parts. Sometimes it makes sense to replace the defective parts of the mechanism. If today's serial clock this issue is solved simply enough, with antiques usually have significant difficulties. Unfortunately often repair and rare antique grandfather clock in modern watchmakers not possible because of lack of parts. We have the ability and sufficient experience in order to restore the quality or make the necessary details of the mechanism and to conduct high-quality grandfather clock repair. Just want to warn you of attempts to self-repair floor clocks. Under no circumstances be permitted to lubricate the mechanism without cleaning and please do not forget - oil is not suitable for any mechanics - it's just food. An attempt to increase the weight of the kettlebell makes the already high burden on the friction parts. So, you're trying to deal with the investigation, but we must first eliminate the cause of failure mechanism. This "repair" is not valid, it is only a source of additional trouble him much more harm. Our master clock generating floor renovation will eliminate the cause of the stop mechanism, and not one, but all lead to a mechanism in order. Often the cause is simply stop moving floor clocks, for example, in another corner of the room. Before moving clock should be prepared - at least to remove the weights and pendulum. If after installing the clock did not go, repair floor clocks are usually not needed, simply adjust the speed. If you for some reason failed to repair floor clocks in other workshops, please try to call our master. We will carry out repair floor clocks with quality assurance, in a place without transportation that will prevent damage in transit, at a convenient time for you and with perfect control, taking into account features of the room, where are your hours. Want to buy Seiko SNA139P1.